Update: There is now a newer driver that allows HF tuning without hardware mods via a different mechanism. The new mod seems to work better than this one. Read about it at https://www.rtl-sdr.com/new-experimental-r820t-rtl-sdr-driver-tunes-13-mhz-lower/. Over on the Reddit RTL-SDR forums user Jengal has posted a modified RTLSDR.dll dll file for SDR# which allows the direct sampling mode to be used on the R820T without the need for any hardware modifications. The modified dll is compiled from keenerds experimental branch of the RTL-SDR driver, which uses code for the no hardware mod written by tejeez. The no hardware direct sampling code was inspired by Anonofish’s discovery where he found that the E4000 based RTL-SDR could tune to AM radio without the need for the direct sampling mod (though this appears to be now patched in the newer rtlsdr drivers). The direct sampling mod is a hardware modification to the RTL-SDR which allows it to receive HF frequencies between 0-14.4 MHz without the need for an upconverter. It works by connecting an antenna directly to the RTL2832U chip, thus bypassing the tuner. Teejez’s modification tells the RTL-SDR to bypass the tuner in software, allowing antennas to be connected to the normal antenna port. HF reception with the experimental driver is very poor in comparison to the direct sampling hardware mod or an upconverter, but even so Jengal was able to receive AM Radio, an SSB ham radio signal and an HF weather report with a simple longwire antenna. To use the modified dll, simply download it from this link, rename it to rtlsdr.dll, and replace the original rtlsdr.dll in the SDR# folder. Then connect an HF antenna to the normal antenna port and in SDR# tune to a frequency between 0-14.4 MHz. Next turn ON the RTL AGC option in the configure menu. Jengal replaced the function of the RTL AGC option with the direct sampling mod. He found that best reception occurred when he set the gain to 48 dB. your direct sampling download does not work. No possible mod for E4000 and other tuner ? After re-naming & replacing the rtlsdr.dll file in the SDR# folder, the program errored indicating “no device selected”. This mod works pretty well with the R820T2. The lowest frequencie I could hear was 5920 kHz. With a better antenna the reception should be much better. Now I just used a 6 m wire hooked up vertically on my roof. ok how do you get it to work i replace the dll, and it say no radio no bandwidth….. what am i missing…..
je tiens à vous précisez que je n’ai sur mon pc que 512 ram et suis sous windows xp pro . Dans l’ attente d’ une réponse de votre part , recevez mes salutations . Preselection and impedance tuning via MFJ “T Tuner” – acting as high pass filter. 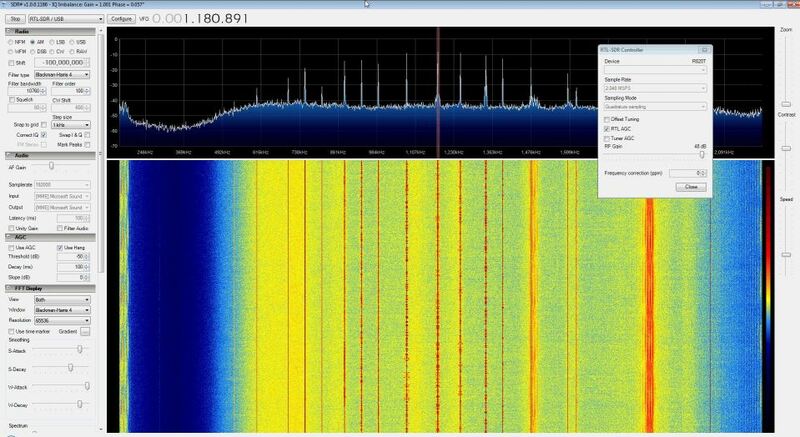 So nice start for SDR on shortwave – try it! I am wondering if low sensitivity comes from the mismatch of the input circuit of the tuner chip – so maybe some tweaks could give improvement here. Any luck with the RTL2832U & R820T yet? More of these are available then the E4000 chipset. I have a bunch of the R820Ts here. I tried the DLL out and it seems to make no difference. I stuck my 40m Delta Loop on it and nothing. I did see the noise floor lift and a bunch of AM intermod that’s about it. Nothing tunable. May not be useful for SW reception but would work great as a monitor for my HF transceiver. My FT990 has no TX monitor function. This application could be used to monitor TX. También he probado y es muy mala recepción. También trató con filtros..
El uso de un toroide directa en rtl2832 pone mejor. Sin embargo, el convertidor elevador es el campeón. From the comments, I’ve learned about the SV1AFN Design Lab’s DC-55MHz upconverter for an RTL-SDR receiver. It features selectable bypass, selectable LNA featuring about 20 dB of gain from parallel Mini-Circuits Gali-74+ amplifiers, and a design with excellent filtration on the input and local oscillators to reduce harmonics and interference, it should be a very good performing upconverter-amplifier. It’s a kit with SMD parts pre-soldered; you wind a few transformers and connectors or you can purchase it assembled. With these choices, there are plenty of options for getting HF signals into the VHF ranges for use with the RTLSDR. It’s not difficult to modify these plans for even higher fidelity and accuracy, such as by increasing filtering on the power lines, building a shielded enclosure, improved antenna systems, and more. I’ve been using my v3.1 Converter from Wimo for a few months, and have been very happy with its performance so far – there’s little noise and leakage, and I use it to pull in shortwave broadcasts from all over the world including the BBC, China, Cuba, Japan, Russia and more from my home in Seattle with only an 80″ long wire and a string of adapters – I highly recommend that model, or any of the models in this family, for great performance. I’m looking forward to trying out some of these other ones. If you’re looking for a more rugged commercial solution, High Sierra Microwave has an upconverter (FCD-1-55-UC) with a 133MHz LO frequency and BNC terminals with an integral amplifier. I’m a fan of converters whose LO frequency shifts the entire HF range above the FM broadcast band in general and the shielded enclosure will definitely cut down on noise. Looks like it’s suitable for mounting outside at your antenna’s feed point, and it also looks like you’re going to pay for those features. I’d love to evaluate one of these if I could get my hands on one. Marty KN0CK has developed an incredible upconverter which fits inside the tuner dongle’s enclosure using all 0402 SMD parts. It’s a complete stack, including the RTLSDR tuner and hand-assembled integral filter and pre-amplifier using the Mini-Circuits MAR-8+ amplifier. Very powerful, great at picking out weak signals, and requires no external hardware or cabling everywhere – just hook up an antenna and go. Available for $75 US plus shipping (U.S. and International shipping available), this is a addition to your ham shack. Buy it over at Easy-Kits. Easy-Kits site is currently down. If you’d like to purchase one, contact KF7LZE through this site; look for a Buy button soon. Sorry! CT1FFU v5 HF converter is a brand new iteration of the long-standing design which was originally one of the first released. This model features an improved smaller PCB size, improved filtering and am improved ring mixer, and phantom power to eliminate a power cable when attached to certain compatible RTLSDR receivers. The LO is still 65.520MHz or 106.250MHz which might interfere with an FM Broadcast band in some countries, such as the U.S., but there is some filtering incorporated to eliminate that. The price is reduced to 55 Euro shipped worldwide with tracking. If you’d like your RTLSDR to be able to access very long wavelength bands, you’re going to need an upconverter. There are quite a few choices for an HF converter / up-converter are now available which use a mixer and crystal oscillator to shift incoming signals into the tuner’s frequency range. These range from pre-built boards, partially built kits, and plans depending on your skill level and interest. An assembled board or a partially assembled kit will set you back about $50-100; if you’re savvy you can probably make it for $10-20 in parts – if you don’t mind winding your own coils. Your mileage may vary. If you have a plan, kit, or finished product you’d like to share – or if you know of one I’ve missed – send me an e-mail or leave a comment here! without the filter, the reception was very poor. broken link, you talk but does not show, is true? Romanian amateur Alexandru YO2LDK built a simple HF upconverter circuit using an NE602. This has an amplifier, limiter, regulated supply and 100MHz frequency like several of the ones pictured, but the circuit itself looks quite different. The amplifier stage is ahead of the limiter, which looks like this one is offering a constant gain versus the adjustable gain some of the others have offered. It looks like this one has more tunable components, which means a little more work to dial it in. I didn’t see any photos of the completed product. I found the bad outcome. little sensitivity!! What antenna did you use Admin? HF? It is not so good for the R820T tuner. Nothing but static. 820T. 2048 sample, quadrature, 48dB gain. Sig gen on my desk, figured I’d check this .dll out. 0-450KHz is deaf. very low gain ramping up slowly through 1MHz. 1-4MHz low and slow ramp in gain. 4-8MHz low but fair gain and fair flatness. Slow ramp down in gain till deep deaf null at 9.487MHz. picks back up and stay relatively flat and low gain through 14MHz. Nifty hack. Thanks! I get DLL and put #SDR all work good from 3MHz to 9 MHz after go down . Interesting mod, signal gain is rather low with hf antenna direct to antenna port on the usb dongle. Had a quick test with 10dB preamp bodged inline with HF antenna and it does the job rather nicely! Now I just have to tidy the mess on the bench and squeeze the the preamp and filter into yet another ‘tobacco tin’ 🙂 Good Work Matey!! If you look here it is credited as “tejeez’s no-mod direct sampling ” https://github.com/keenerd/rtl-sdr/commit/b36ea08cc7241113f3b01196f521d305c5e04bac not keenard’s though it still might of been inspired by Anonofish. When teejeez discussed it on the irc chat it seemed like it was either a tweaked or a better way of doing it. Keenard did say on the chat after merging the patch that he needs to run tests as it has not been optimized for best parameters, but I guess real life has kept him busy as that was a couple months ago. Thanks for pointing that out. Have added attribution for tejeez.